Ahead of today's sole practice session, the air temperature is 25 degrees C, while the track temperature is 43 degrees. Sebastian Vettel topped the timesheets in yesterday early, and less relevant, session, with Lewis Hamilton setting the pace in FP2. In both session however, it was tight with the usual suspects covered by under a second. As ever, drivers were frustrated by lack of grip, while the wind, particularly across the pit straight, didn't help. Indeed the winds are even stronger today. That said, there were no major issues, Romain Grosjean being the only one to touch the barriers on a day that saw several spins and numerous offs. With degradation "very low", according to Pirelli, it looks as though the race will be a one-stopper, exactly what you need at a track like this. Vettel is already at the end of the pitlane as the lights go green, the German clearly an eager beaver. He is followed by Wehrlein, Bottas, Ericsson, Raikkonen and Magnussen. A mixture of softs and ultrasofts, but no supers. While most pit at the end of their installation lap, Bottas stays out, the Finn on the yellow-banded soft tyre. However, the Finn pits at the end of his second lap leaving Vandoorne with the 'honour' of posting the first time of the day, a 41.103. Perhaps, mindful of the fact that like FP1, the timing of this session has little relevance in terms of qualifying and the race, there is very little activity, the drivers appreciating that as the sun begins to set the temperatures will fall, thereby creations conditions more similar to qualifying and the race. Ten minutes in and only Vandoorne has posted a time while four drivers, including Hamilton, have yet to appear. Raikkonen heads out again, sporting the ultrasofts. The Finn subsequently posts a 38.999. Hartley subsequently posts 42.330. Having suffered oversteer yesterday, todays it's understeer that is plaguing Hartley, the Kiwi claiming that perhaps the team went "a bit too aggressive with the tyres". Vettel makes it a Ferrari 1-2 when he posts 39.152. Moments later, Bottas goes third with a 39.205. 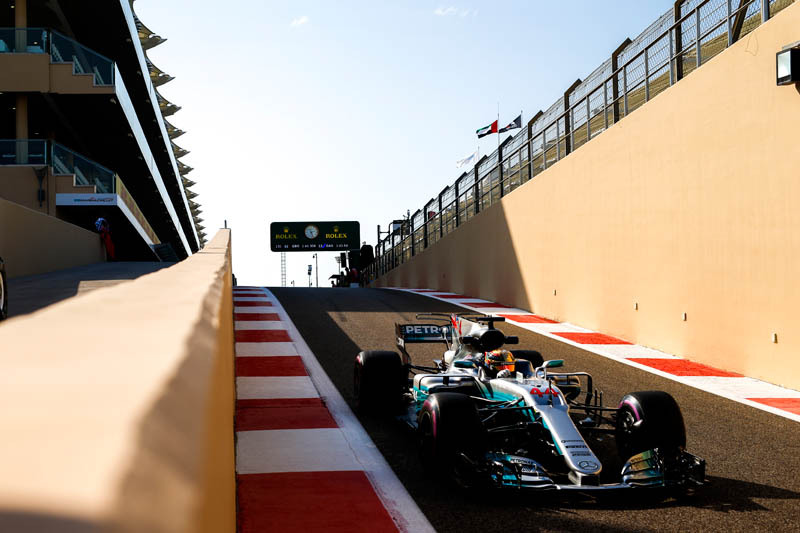 No messing for Hamilton, the Briton heading straight to the top of the timesheets with a 38.702, the world champion, like Bottas and the Ferraris, on ultras. Vettel improves with a 39.063 but so too does Bottas, the Mercedes driver banging in a 38.637. Vettel reports that his car is "pulling to the left". Alonso goes fifth with a 39.898, ahead of Perez, Ocon and Grosjean. A 38.159 sees Hamilton reclaim the top spot, the Briton reporting that Vettel went "very wide in Turn 1, I don't think that's allowed". When told the German is allowed to run over the Astroturf, the Briton responds: "He went way beyond the Astroturf." The world champion subsequently admits that he went wide in T5, "just in case Alonso was alert". Vettel reports that Sainz is on fire, but there is no evidence of this. "I'm not learning anything," reports Grosjean who is currently 11th (40.792). Out come the double yellows as the TC cameras pick up on a parasol which has been blown on to the track. As the VSC is deployed one wonders in there's a deckchair out there somewhere for Mr Alonso. The parasol removed, the VSC is withdrawn. Massa improves to 8th with a 39.949 as the Red Bull duo remain over a second off Hamilton's pace. "Oh Jesus, completely no brakes in T1," reports seventh-placed Hulkenberg. "I must have a big flat spot." Stroll improves to 16th with a 40.917, though he and his teammate are currently 3rd and 4th through the speed trap. Raikkonen retakes the top spot with a 38.157, just 0.002s quicker than Hamilton. Meanwhile, countryman Bottas does brilliantly not to have a massive accident when he carries too much speed into the final corner and almost hits the barriers. Vettel improves to third with a 38.174, the top three covered by just 0.017s. Alonso improves to sixth with a 39.368 despite a clumsy final corner which saw him ride the kerbs. The Spaniard, who reports a "strange feeling", is advised that his moment could have been due to the wind blowing dust on to the track. As the qualifying sims get underway, the Toro Rosso duo are rooted to the bottom of the timesheets. Quickest in the final two sectors, which actually favour Ferrari and Red Bull, Hamilton goes quickest with a 39.627, 0.5s up on Raikkonen. "Hamilton sets fastest lap of the weekend so far, Mercedes looking very strong but quali and race temperatures will be different," Pirelli reminds us. Bottas goes quickest in S1 but loses a little pace in S2. At the line the Finn posts 38.630 to go second. PBs in all three sectors sees Vandoorne improve to seventh, ahead of Verstappen. PBs in all three sectors now see Verstappen improve, the Red Bull driver leapfrogging Alonso to take fifth. As in Brazil, Red Bull appears to be restricting its running in a bid to save mileage. Verstappen has currently done 11 laps and Ricciardo just 9. The Ferraris and Mercedes have done between 15 and 17. "Ha, unbelievable, so difficult to drive, doesn't make any sense, I'm coming in," sighs Verstappen. Told to do another lap, he says: "No, I don't want." Half a second ahead of the opposition - read Ferrari - the Mercedes duo appear to have gone for an early luncheon. Ricciardo improves to fifth with a 38.340, and though 0.71s off Hamilton's pace he is now ahead of his Red Bull teammate. We were wrong, the Mercedes duo are back on track. Indeed, so is everyone else bar Verstappen and the McLarens. Sounds like a 60s pop group, though Max and the McLaren would sound better. A late improvement sees Gasly leapfrog Ericsson for 18th. Interestingly, McLaren, ahead of the Force India duo, are best of the rest. Imagine if the 'Alonso curse' is about to strike again and Honda is on the verge of coming good. A very down Stroll is given some mollycoddling by his engineer, former Ferrari man Luda Baldisserri. A late 'battle' between Hamilton, Alonso, Perez and Grosjean sees the Spaniard emerge as victor. As the session ends, like Monaco, the cars head to the grid for a practice start. An interesting session, and other than the battle for pole, which appears to be all about Mercedes and Ferrari, there's McLaren seemingly having an edge over Force India, and with just one pit stop expected tomorrow on this most notorious of tracks, it's all to play for between Renault, Toro Rosso, Haas and possibly even McLaren as they eye that team standings prize money. Check out our Saturday gallery from Yas Island, here. "What I am most amazed at is the fact that Stroll is no where near Massa....why doesnt daddy Stroll realise that he is wasting his money. No talent, just loads of money... It doesnt buy you TALENT...I just hope that Robert Kubica get the drive and wipes the floor with him."